Do you ever look at yourself in a photo and say, “Great picture, but I wish my teeth were straighter.”? Maybe you wish your teeth were straighter. Maybe you wish your teeth were whiter. Maybe you wish your teeth were larger. Maybe you want to close a gap in your teeth. It’s important to have attractive teeth as part of your smile, because those pearly whites make a lasting first impression. Nearly one-third of Americans say the first aspect of someone’s face they typically notice is his or her teeth, and 24% say this is also the facial aspect that they remember the most after meeting someone. Most of us have had some discussion with our dentist asking “What can I do to fix this?” or “What can I do to improve that?”. There are many options for making a cosmetic improvement to your smile. Braces and Invisalign will straighten teeth and close gaps, custom home Teeth Whitening is available to achieve the brightness you want in your smile, and Veneers can often accomplish all these goals at the same time. While Braces, Invisalign, and Whitening are all fabulous options we offer at Metropolitan Dental Care, some people don’t want to take the time to accomplish the results we see from these treatments. These days, people are drawn to the convenience of a quick and long-term result, and Veneers offer just that. What would you say if we told you, you can have the smile you always dreamed of, in just TWO VISITS? 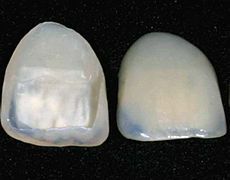 Veneers are wafer-thin, custom made shells of tooth colored porcelain designed to cover the front surfaces of teeth to improve their appearance. These shells are bonded to the front of the teeth changing their color, shape, size and/or length. Here are a couple of examples. See more before and after results here. The color, shape and characteristics will be customized based on your needs. The first veneers were invented by a California dentist in 1928 and were used short-term for movie roles. 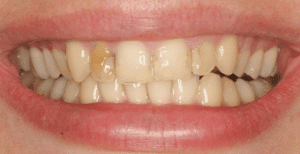 Over the years the bonding process and materials have evolved, offering a long-term result for patients. If you would like a more in-depth explanation of the history of a veneer and how the process works, please check out this great article. Keep in mind there are some limitations with veneers, but most of the time they are a great option for people looking for quick, lasting cosmetic change. All four of the doctors at Metropolitan Dental Care are masters in the artistry of cosmetic dentistry and would be happy to meet you, either in our Downtown Denver or in our Lone Tree location, to discuss creating the smile you have always dreamed of. There are countless benefits to smiling, and you should have the confidence in your smile to flash your pearly whites regularly and often.